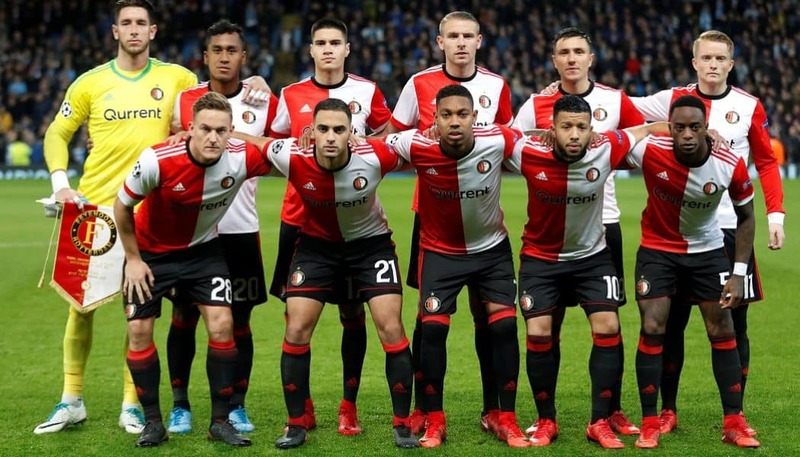 Feyenoord is currently the 3rd team in Netherlands 1st division league, with an overall record of 9-2-2 and only 1 defeat in the last 11 league games. Looking at their last 5 matches, Feyenoord has lost only 1 against 2nd placed Ajax (3:0). At home, however, they are one of the 3 teams who has not yet lost a match, in fact, they are 7-0-0 at De Kuip stadium, which is as good as it can get. Looking at their last match, that happened on the 2nd of December, it was Feyenoord playing against PSV at home. The opener was scored in 28th minute by Feyenoord, with the second goal following only 5 minutes after. At this point, Feyenoord was in a well deserved 2 goal lead over the league leaders PSV. With 57% possession, and 10 goal attempts (5 shots on goal) the lead was not as surprising as it might seem before the match started. Going into the 2nd half, PSV was the team who dominated. With 61% possession, 10 goal attempts and 4 shots on goal, they were far superior to Feyenoord, who seemingly decided to defend the score they got in the first half. After many failed attempts, PSV scored their first goal in the 72nd minute, however, they have failed to score an equalizer for the remaining 18 minutes, thus suffering their 1st defeat of the season. Final score: 2:1. The visiting side today, Venlo is currently 8th in the league with an overall record of 5-4-4. Looking at how they performed in their recent matches, Venlo has won 2, drew 2 and lost their most recent match against Heracles (4:1). In their away games, Venlo does not fare too well, in fact, they have not won an away match since 25th September, which totals 5 games in all competitions. Venlo played their last match against 4th placed Heracles, which as mentioned ended in (4:1). The opener was scored only 3 minutes in by Heracles, however, it was the only goal we saw in the first 45 minutes, despite a total of 12 goal attempts from both sides combined. The second half was completely in Heracles favour. They held a 62% ball possession, had 14 goal attempts and 5 shots on goal, 3 out of which find their way into the net. The second goal for Heracles was scored in 49th minute, with the 3rd coming from a penalty in 55′. At this point, Venlo was 3 goals behind and it was almost certain this match was lost for them. In the 65th minute, Venlo scored a goal of their own, which put teams at 3:1, but Heracles prepared an answer only 4 minutes later with their 4th goal of the match. The time ran out with neither of the teams managing to score another goal. With that, Venlo suffered their 4th defeat in the season and 3rd in away games. Final score: 4:1. Looking at these two teams, it’s clear that Feyenoord is a better side and we expect them to win here. But the question here is how many goals will we see? In home games, Feyenoord has scored 16 goals and conceded 4 in the span of 7 games, Venlo on the other side scored only 6 goals but conceded 12 in the same amount of games. In their H2H matches, there is no clear winner, in fact, both teams won, in the past 5 games. Venlo seemingly does perform decently against Feyenoord, they might not win tonight, but still, I don’t believe this match will go over 3 goals.